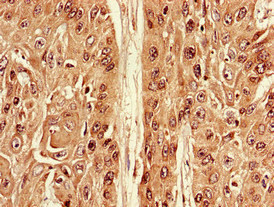 Immunohistochemistry of paraffin-embedded human cervical cancer using ATG7 Polyclonal Antibody at dilution of 1:100. Immunofluorescent analysis of U251 cells using ATG7 Polyclonal Antibody at a dilution of 1:100 and Alexa Fluor 488-congugated AffiniPure Goat Anti-Rabbit IgG (H+L). 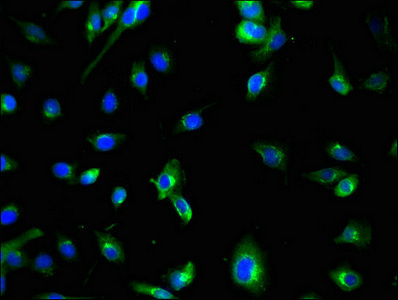 ATG7 Polyclonal Antibody. Unconjugated. Raised in: Rabbit.